The ruins of the ancient deme of Rhamnous, Attica. The ruins of the ancient deme of Rhamnous, of the Aiantis tribe, are preserved in the valley of Limikon at northeastern Attica, ​not far from the ancient site of Marathon, where the famous battle took place, and near the village of Grammatiko of nowadays. We took a pleasant drive that lasted less than an hour from the heart of Athens. Just after the first Toll Station of the National Road Athens-Lamia, we followed the signs to Kapandriti, Varnava, Grammatikon, and then the brownish signs indicating an archaeological site. An unassuming ticket office where we were asked to pay a nominal 2-euro entry to the fenced archaeological site. From then on we were followed by the cutest kitten, who wanted interaction and petting! Rhamnous is actually the best-preserved of all ancient Attic demes. The name "Rhamnous" derives from the plant rhamnos (scrub). The view of the island of Euboia from Rhamnous. Rhamnous is actually the best-preserved of all ancient Attic demes. The name "Rhamnous" derives from the plant rhamnos (scrub). The ancient settlement was fortified. Inside the walls, several public buildings, sanctuaries and houses were erected. In the acropolis of the town an Athenian garrison was permanently stationed, guarding the sea route between Attica and the island of Euboia. The lower part of the fort included a small theater, a gymnasium, a small sanctuary of Dionyssos, a number of other public buildings and houses. The ancient road which connected Rhamnous and the neighboring demes and leads to the town, was flanked by impressive burial monuments. 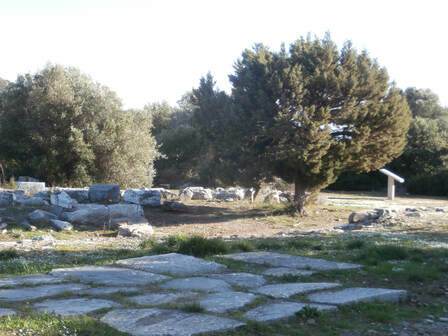 On a prominent spot near the ancient road lies the terrace of the sanctuary of Nemesis, built in the 6th c. B.C. In the 5th c. BC the large temple of Nemesis was constructed in the Doric order with 6 columns on its narrow sides and 12 on its long sides. The famous statue of the goddess, a work by Pheidias' pupil Agorakritos, was housed within it. 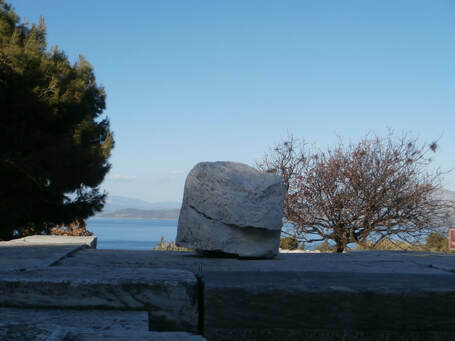 According to historian Pausanias the statue was of the specific piece of marble from the island of Paros, which the Persians had brought with them to use for the trophy of their victory at the battle of Marathon. But the goddess Nemesis punished them for their arrogance (hybris). Its relief base (ca. 420 BC) depicted Helen being brought by Leda to her divine mother Nemesis. View from within the sanctuary of Nemesis at Rhamnous. Themis was worshiped in the smaller temple, dated in the 5th c. BC. This building was used as treasury of the main temple of Nemesis. Noteworthy statues were found inside of it, including a statue of Themis (now in the National Archaeological Museum) ca. 300 BC. Its base bears an inscription with the name of the local sculptor Chairestratos. Around the end of the 4th c. AD the first Christians destroyed the statue of Nemesis and the monuments, and the whole area declined. However, the remains of the sanctuary and the fortification have never been entirely buried in the ground and are visible to travelers and visitors ever since. The first excavations at the site were carried out in 1813 by the Society of Dilettanti. Later, in the 19th c. the excavations were taken over by the Athens Archaeological Society. 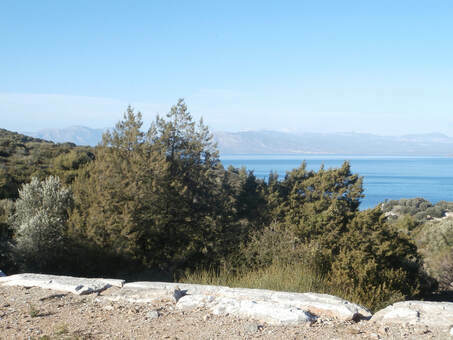 Since 1975, Vassileios Petrakos resumed excavations in order to obtain an overall picture of Rhamnous. 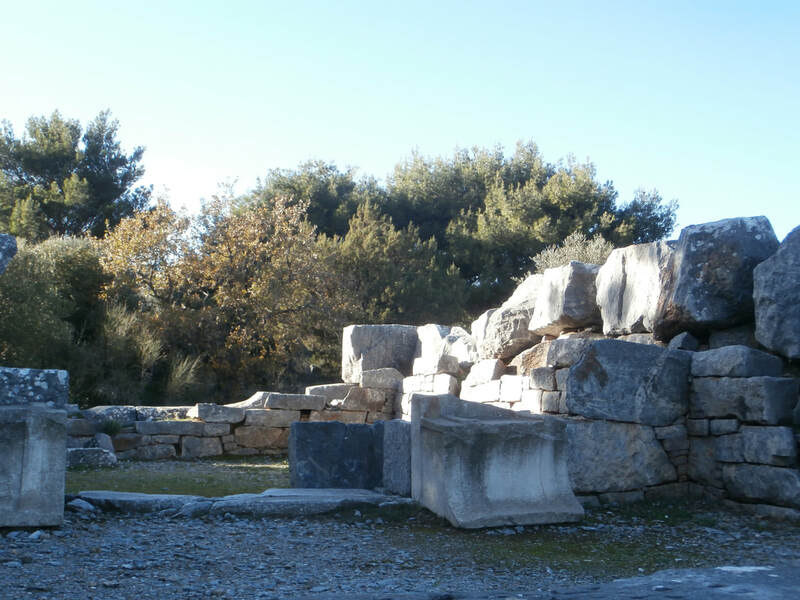 Ancient ruins at the peaceful site of Rhamnous, Attica.